Today's theme is "Sideline Out-of-Bounds Plays" - featuring just a few. 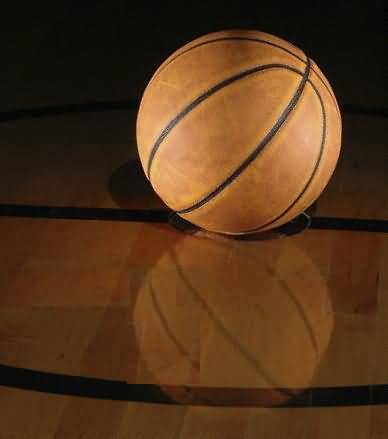 Having a good sideline play or two can make the difference in a close game. This sideline play features a possible high lob pass to the basket, or a dribble-drive to the hoop. O2 screens for O1, and O1 is our safety inbounds receiver. In this play O3 is athletic and is very good at attacking with the dribble, or the pull-up jump-shot. 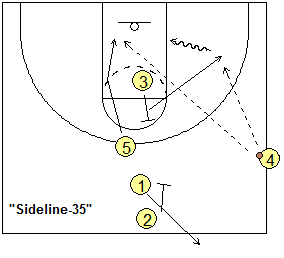 O3 back-screens for O5, and O5 cuts hard to the hoop for a possible high lob pass and lay-up (or dunk). It's important for spacing that O3 sets this back-screen at or above the 3-point arc. As soon as O5 cuts around the screen, O3 slips to the ball-side wing area, receives the inbounds pass, and immediately attacks the hoop with the dribble, or might instead choose a pull-up jump-shot. On the dribble-drive, O5 is on the weakside block for a possible bounce-pass from O3. Another option is for the inbounds passer O4 to cut to the 3-point arc for a possible pass back from O3, and a 3-point shot. 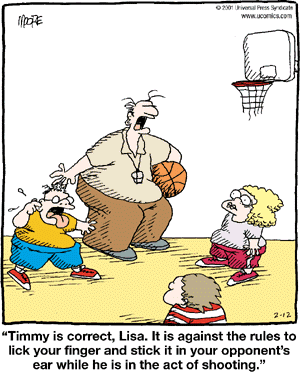 Also see "Sideline Out-Of-Bounds Plays".